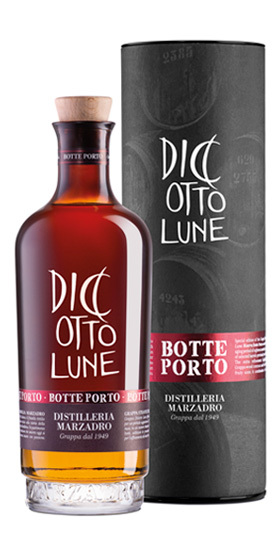 A second special edition of the Grappa Stravecchia, Le Diciotto Lune. Riserva Botte Porto comes from an additional aging period of eighteen months, in a limited number of selected barrels previously used to age Porto wine. The extra refinement highlights the sharper Grappa-wood contrast and the Porto barrels add a fruity scent. A combination of unique sensations. Aging method: 18 months in small barrels made of different woods; 18 months in Porto barrels.